One feature the iPhone Camera app badly needs natively is a self-timer, which allows you to set a time delay, say 10 seconds, before the camera shoots a picture. This lets you as the photographer be able to set the camera up somewhere, set the timer, then walk on over to be in the frame of their own shot. It’s a widely used and essential camera option for taking group photos of family and friends when there isn’t another individual around to take the picture, and in the age of posting everything to Facebook and Instagram, a lot of people just use it to shoot “selfies” too. The self timer feature is so widely used and so standard on every other digital camera out there that it’s actually quite surprisingly Apple hasn’t included it in the iOS cameras yet. The good news is that many third party developers have stepped in to fill the void, so while we wait for the inevitable addition to the iPhone default Camera app (we hope, at least), there are a variety of options to choose from if you want the ability to set a timer to take a photo. We’ll cover a free option, because if you’re just looking to shoot self-timed shots occasionally then there isn’t much reason to pay for something so basic that will almost certainly be included in iOS natively at some point, but we’ll also cover a good paid app that is a bit more full featured for those looking for more advanced timer options and just a generally advanced camera. 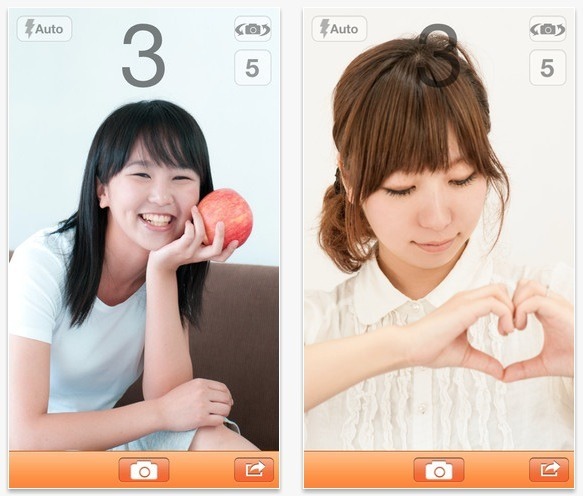 TimerCam is probably the best free option for a simple self-timer app, if for no reason other than being free and remarkably basic. Using TimerCam is as simple as it gets, tap the number on the screen to set the timer in seconds, the free version has options for 5, 10, 15, and 30 seconds. There’s a toggle to switch from the front to back camera, and to use the flash or not. That’s really all there is to it. No, t’s not the most attractive thing in the world, with a fugly orange UI and some non-retina elements, but it works just fine and if all you want to do is take a few timer shots every once in a while it’s more than adequate. As we’ve said, if you’re just looking to take an occasional shot or two with the timer option, just get TimerCam and put up with the ugliness and ads (and yes, you can block them temporarily by turning on AirPlane mode). If you want more options in general or a nicer UI experience, the next two app options are significantly better apps, but they’ll cost you a cup of coffee. Camera+ is basically what the iPhone Camera app should be. It has the self-timer option we’re all looking for, but Camera+ is really much more than that, and with minimal effort you can utilize advanced camera features like controlling focus and exposure separately, rather than locking them together like in the default iPhone Camera app. There are also simple options to adjust lighting and exposure for different scene types, the ability to adjust colors, temperatures, white balance, and tones right in the app, and a handful of filters that don’t look tacky (unlike some of the others out there). You also get the grid, digital zoom, an flashlight toggle to light up subjects for portraits, a digital stabilizer, cloud syncing between your other iOS devices, and a pretty good photo manager. All of these side features are reaching beyond the scope of the timer feature we’re looking for, but Camera+ really is an excellent app and if you’re an avid iPhone photographer it really should be included in your app repertoire. The only real weakness of Camera+ is you may find the timer itself to be somewhat limited, and since that’s the primary purpose we’re looking for here, an app that is focusing on that and branching from there may be better suited to you. 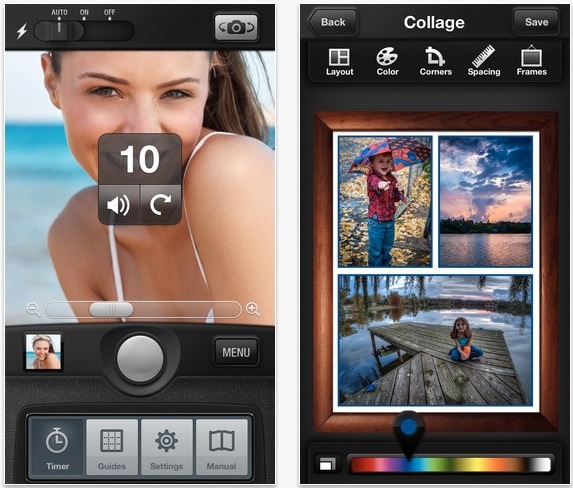 PhotoTimer has the same general self-timer features as TimerCam, but includes timing options of up to a minute before triggering, offers a grid guide like the default camera app for rule of thirds shooting, zoom settings, and then branches into more artsy options with optional collages, color adjustment, frames, photo effects, and better sharing features. It’s also retina ready and has a much better UI than TimerCam, but again if all you’re looking to do is take a self-timed picture every once in a while then there’s little reason to buy PhotoTimer. On the other hand if the advanced options are necessities or sound good, $2 is pretty cheap to add a sorely needed feature to the iPhone’s camera. For setting timer countdowns, PhotoTimer is probably the best, but it’s not as good as editing photos or fine controls as Camera+. On the other hand, if you just want to use the timer feature, you can use PhotoTimer then edit the pictures through the excellent Snapseed app, which is free and arguably the best consumer level photo editing app available on the iPhone (and iPad, for that matter). iOS 7… please bring a self-timer! It does seem a bit strange for one of the most basic point-and-shoot features of a camera to not be bundled onto the iPhone alongside the options for, cropping, HDR, and Panorama, but here’s to hoping that iOS 7 or later will add the feature… sooner than later! 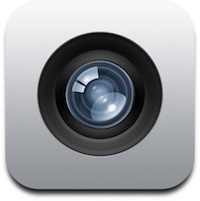 I definitely agree, this should be a standard option in the camera app. Burst shots also need to be included. Why Apple ignored these fundamental photography basics while implementing advanced features like HDR is a little strange, but I do think they must be coming in the future. Too simple not to, right? Anyway, I’m a cheap skate so I like free apps when something is bound to be included by the manufacturer, and likely implemented better too. I went with Camera Timer, it’s free and also looks like a pig, but it works and includes a burst mode. Camera+ is a great app but it’s overkill for just these features alone, in my opinion. Cool, I liked. I hope this feature be native in the next iOS version! Yup iOS 7 needs this. iOS 4 needed it. But Better later than never. Totally agree. Apple should have included self timer and multiple burst long ago. Also the lack of zoom in video mode is causing Apple to fall far behind the others. I agree with all the above. Also have a look at GORILLACAM. 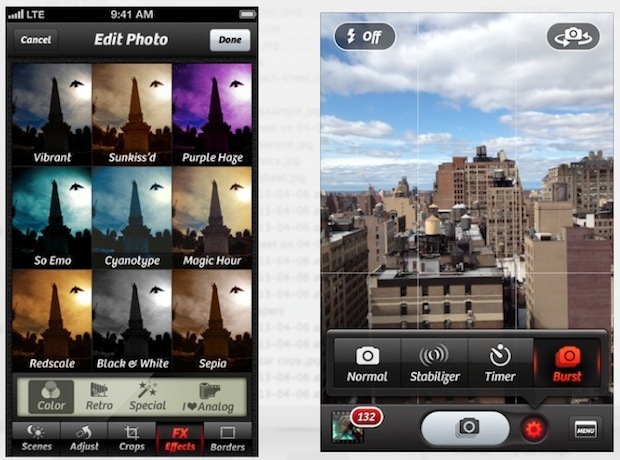 It has a self timer, is free and has quite a few other nice touches like spirit level, grid, burst mode, time lapse etc. Checking out GorillaCam right now, great recommendation! The GorillaPod’s are excellent accessories, I didn’t know they made apps too.